When the leaves fall from the trees and winter draws in, it’s time to think about clipping your horse’s coat. Showing expert Lynn Russell provides some advice on precisely when and how to go about it. Once their thick winter coats have grown in, horses will sweat much more when exercised and take far longer to dry off, which can lead to them becoming cold and developing chills. Clipping a horse reduces sweating (which in turn conserves the horse’s energy), and enables him to dry off much more quickly after being worked. When your horse starts his winter coat growth will vary. But the first clip should generally be in October or November, with a re-clipping before Christmas and another in January or February. A finer coat will require re-clipping less often than a coarser one, so use common sense and keep an eye on how much your horse is sweating when exercised. The biggest factors in deciding on the type of clip are how much your horse is turned out and the level of work he does. A blanket clip is a good compromise for a horse in moderate work with some turnout time, as the remaining coat provides the back and kidneys with warmth. Horses tend to sweat down their necks, so another option is a bib clip, where a strip under the tummy and up the underside of the neck is removed. I never clip my horses’ legs, as that hair protects them against mud fever and sores, and provides warmth. Of course, you’ll need to rug and hood your horse, as well as look at different stabling routines, to compensate for any coat you remove. If you’ve never clipped before or are unsure how your horse will respond, consider getting an expert in for the first time. Ensure that your horse is secured, ideally with a helper holding him as well. You can also use a haynet as a distraction. Make sure your horse is well groomed, as a clean coat makes for an easier clip – an application of coat shine will also help the clipper glide more easily. Once you’ve chalked the outline of the clip, don’t plunge straight in. 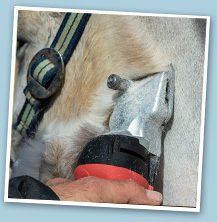 Put your hand on your horse’s neck, set the clippers running, put them on the back of your hand and then remove your hand to start clipping – this will help him get used to the feel and sound of the clippers so he’s not shocked when you start the actual process. Stop frequently to re-oil the clippers. If your horse is nervous, enlist a vet’s help to sedate him, so you can clip safely. Then work on desensitising him: when grooming, keep the clippers running in your pocket, and play around with them while your horse is eating to create a positive association. But if in doubt, always get professional help with a nervous horse to avoid a traumatic experience. As a final tip, think about what you wear when clipping – the hair really does get everywhere!